The 11/16” (18mm) long Cunning Class Corvette with my patented Versi-Bases ™ for only $1.70 for one, and were originally offered in for $3.00 a piece without a base! The Cunning Class corvette is an old but proven design that, after appearing around a century before the start of the Clan Wars, still serves in many navies of the Galaxy. It is extremely well armed for a vessel its size but this comes at a cost, as there is no hanger space. Four star-fighters can be carried on external racks but there is no room for additional support craft. 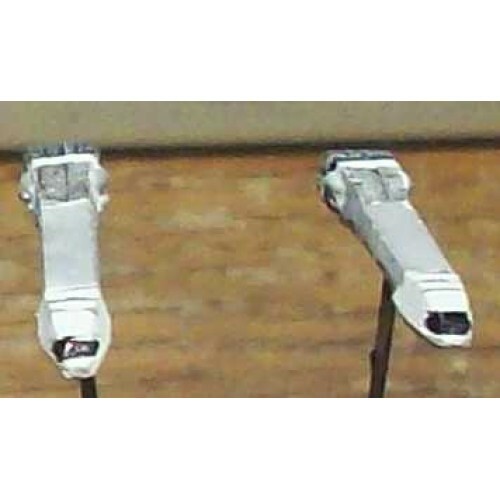 The twenty laser cannons make it highly effective against star-fighters, however these may be replaced with twenty Ion cannons, making it highly effective against larger capital ships.